Last night I went to see one of my girls and her (high school) team play. What began as a great thing ended up a disappointment, as the referees took over the game. I have discussed my displeasure with LA City Section refs in this space before. Think WNBA refs circa 2002: when officials seem to decide the outcome of the game. My young woman ended up in tears after the game. As far as I could see, she was the only one on the squad that upset. It was hard to see her like that. But then again, I took heart from it because she cares – she really, really cares. She has the game of basketball in her heart and soul. Anyone who has worked with young people over the last decade or so knows that many of them live in a sea of apathy, and they don’t seem to care about much. Add to that the fact that basketball has become big stakes and a year-round job, which causes some young people to become like zombies when they play. It hurt me to see her that upset last night, but big picture-wise, I am encouraged when I see a young person upset after a loss. More caring like that is exactly what this world needs right now. There is hope. Funny you commented on officials as an aside to the more important theme of caring today. I got my first technical foul last night in 12 years (of course I haven't coached for 11, sticking to administration over that time 🙂 because of predictable slipshot work on the part of the officials in the high school league I now coach in. They run via the theory that they don't need to protect the "bad" team and that the game will just end sooner and let them get back on the road faster if they sit back and watch a decisive game from the stronger squad. When my own daughter entered high school, her team was the dregs of the area, hadn't won anything of value ever. They got no calls and were treated like sparring partners of the more established teams. Over the four years, she and her team mates became the area's dominant team and the recipients of the sometimes unjustified favorable treatment. 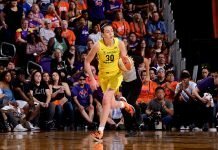 Last week as I scouted them I saw a much watered-down version of her former team allowed to hammer a striving tailender twice on putbacks at the buzzer, preserving a one-point win. Come back in a year or two and the team victimized that night will be getting the calls as they are on the rise. My team is in a down cycle and I took the job a week before practice began. But we have a good group and the girls are trying hard. In one of the games we did win, two veteran refs reported for duty along with a young kid — who was designated the referee for the night. When our event manager asked one of the vets why they were letting the kid be in charge they said "It's only C—— vs. T———-." Not to the two teams its not. Last night's opponent had several players doing what I call the "Heisman Trophy" move, leading with the off hand and pushing off while dribbling. When one girl went to the basket via a chicken wing and I again complained, one of the refs laughed. At which point I got the calculated "T". At which point those guys did what all officials do after becoming so upset with a coach that they "T" him up….. proceeded to give my team nearly every call the rest of the way. If they'd just given me the legit calls early, there'd have been no tech and no need for them to prove they weren't going to be biased against our team after it. People think the conflicts between coaches and officials are either humorous or signs of bad sportsmanship but in truth people who choose to officiate are wired completely differently than those who choose to coach. It's oil and vinegar all the way and likely will never change. To any officials I may have offended with this post, "Merry Christmas and a happy 'When In Doubt White Out' to you." Thanks for an awesome post, Dave. ‘Twas the night before playoffs………….